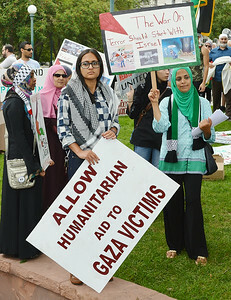 Images of march and rally to protest Israeli attacks on Gaza, including demonstrators with signs and Palestinian flags, children carrying mock coffin, Muslim women wearing hijabs, men and women wearing keffiyehs, shots of restaurant cutomers watching march go by. 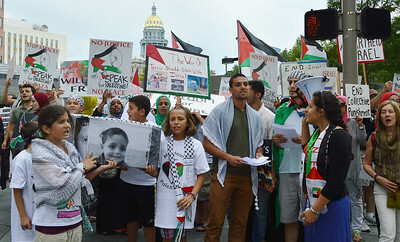 Large group of protesters waiting at street corner, many with signs and Palestinian flags, Colorado State Capitol dome in the background. 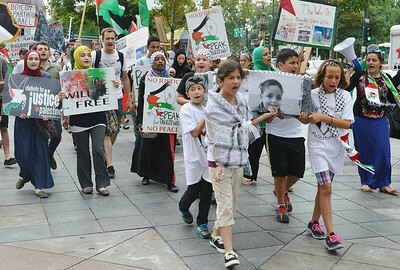 Young girls and boys carrying a mock coffin with photographs on side, some wearing keffiyehs, protest marchers with signs and Palestinian flags in background. 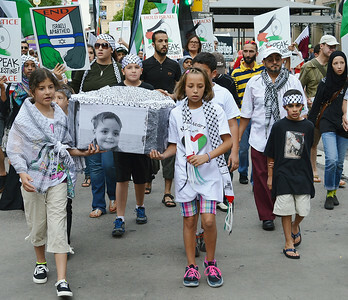 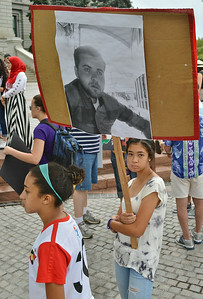 Young girls and boys carrying a mock coffin with photographs on side, some wearing keffiyehs, protest marchers with signs in background. 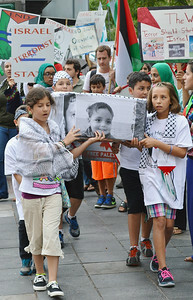 Two young girls carrying mock casket with picture of little boy on it, both wearing keffiyehs, other marchers with signs in background. 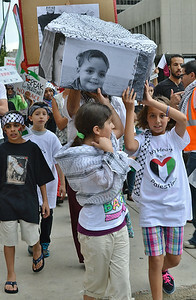 Two young girls wearing keffiyehs and Palestine t-shirts, raise mock coffin with picture of young child on it, above their heads, other young children next to them, more protesters in background. 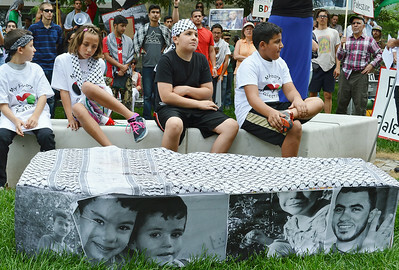 Four young children wearing keffiyehs and Palestine t-shirts, sitting on stone bench, in foreground, mock casket with photographs on it, other protesters in background. 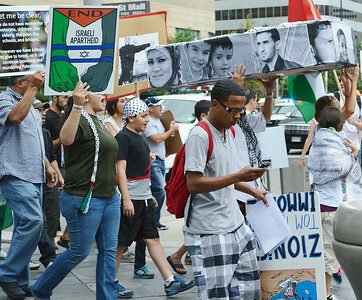 Young African-American man marching in protest, checks cell phone, marchers behind him carry mock casket above heads, other carry signs about Palestine. 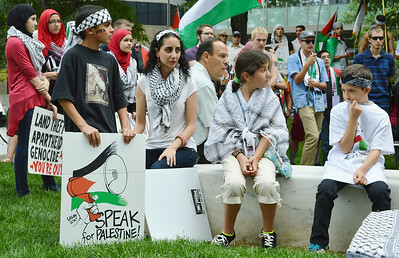 Young woman wearing keffiyeh sits with three children on stone bench, protesters with signs and Palestinian flags in background. 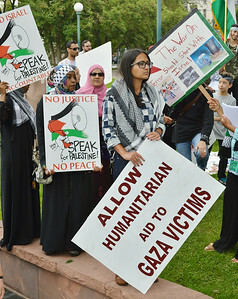 Young woman wearing glasses, holding sign about Gaza attacks, other demonstrators wearing hijabs next to her. 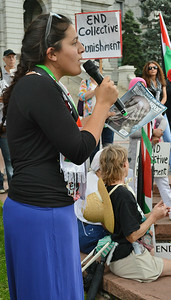 Young woman speaking into microphone at rally, other protesters in background with signs about Palestine. 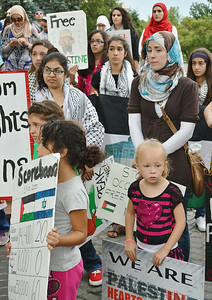 Group of demonstrators at Palestine protest including woman wearing hijab and two young girls holding signs. 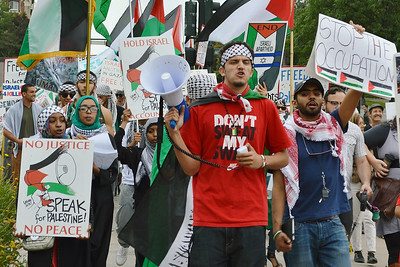 Young man leading large group of marchers at Palestine protest, wearing keffiyeh, and holding bullhorn. 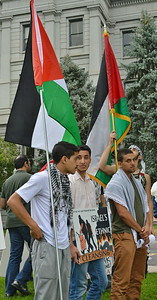 Three young men wearing keffiyehs, Palestinian flags in background. 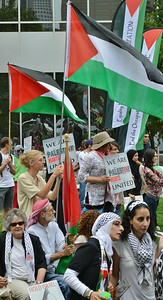 Woman wearing hijab and keffiyeh leans to talk to woman next to her, large group of protesters with signs and Palestinian flag in background. 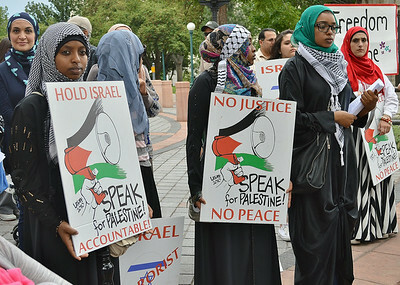 Group of Muslim women wearing hijabs, holding signs about Palestine. 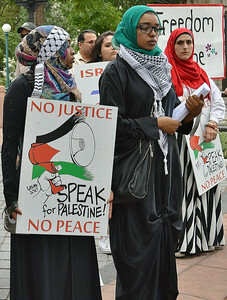 Muslim woman wearing hijab holding sign about Palestine, another woman behind her. 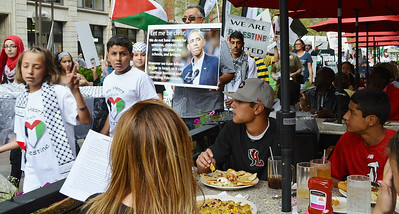 Two young men look up from eating at outdoor cafe to watch protesters with signs about Palestine march by. 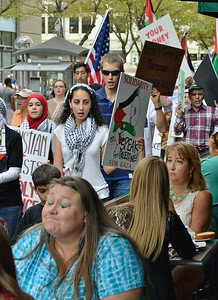 Young woman wearing keffiyeh and young boy look at diners at outdoor cafe as they and other demonstrators march by. 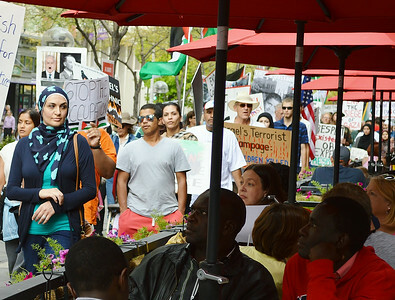 Woman wearing hijab glances at diners at outdoor cafe as she and other protesters march by, restaurant customers watching demonstrators go by. 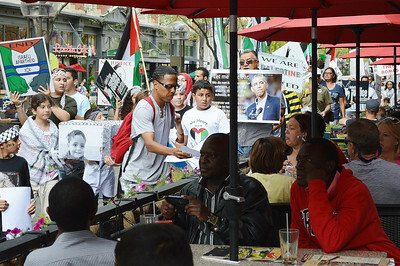 African-American man hand flyer to diner at side walk cafe, protesters with signs and Palestinian flags marching by in the background, two African-American men watch as protesters go by. 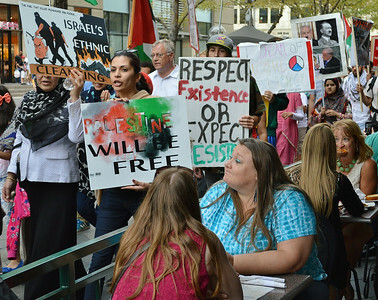 Woman sitting in outdoor restaurant pauses to watch protest march go by, protesters with signs about Palestine, including women wearing hijabs, other diners in background. 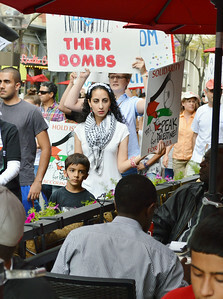 One woman marcher wearing hijab, looks down and away from diners, sign above head. 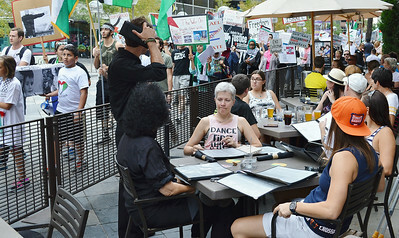 Woman sitting in outdoor restaurant pauses to watch protest march go by, protesters with signs about Palestine, including women wearing hijabs, other diners in background. 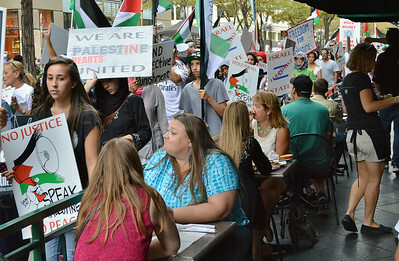 Group of diners sitting at outdoor cafe as protesters with signs and Palestinian flags march by. 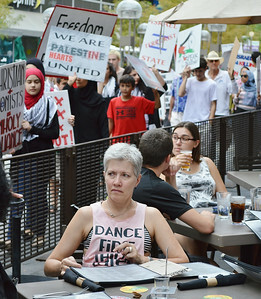 Woman wearing "dance" shirt sitting at outdoor cafe, other diners and protesters with signs about Palestine marching by in background. 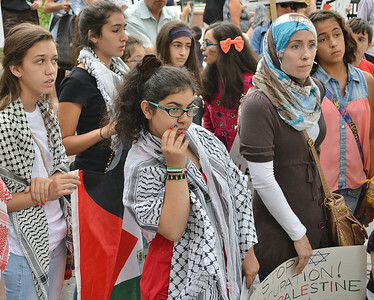 group of women at palestine protest, one wearing hijab, young girls wearing keffiyehs. 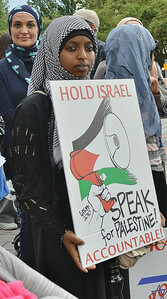 Woman wearing hijab carrying sign about Israel, solid block of signs in background. 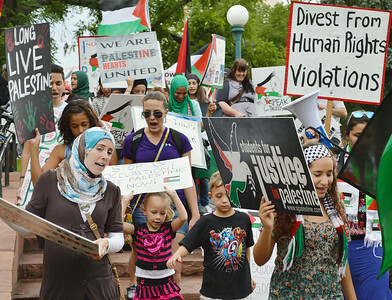 Demonstrators marching down step at palestine protest, many holding signs including woman wearing hijab speaking to two young children. 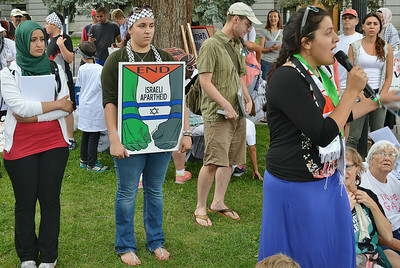 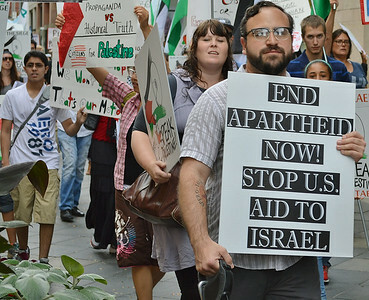 Two young men marching with signs abhout ethnic cleansing and Israel, one turns, smiling, other protesters in background. 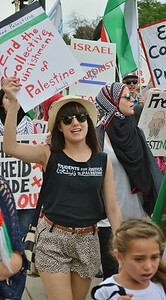 Woman college student marching, wearing sunglasses holding sign about "collective punishment", other protesters with signs in background. 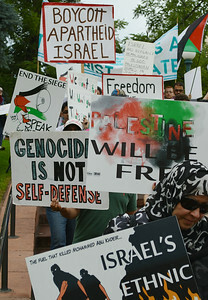 Man marching with sign about Israeli apartheid, other protesters with signs in background. 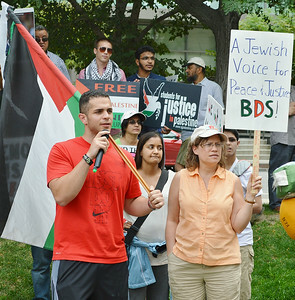 Young man holding Palestinian flag on pole, speaks into microphone, woman next to him holds "Jewish Voice For Peace" sign other demonstrators in background. 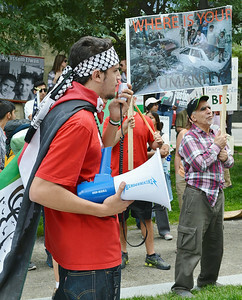 young man wearing keffiyeh and Palestinian flag on his back speaks into bullhorn, other protesters in background. 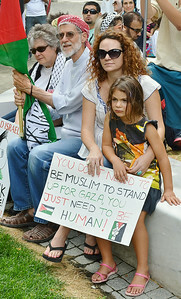 Woamn sitting with daughter on stone bench, holding sign about Muslims and Gaza, next to them, older man and woman, man wearing keffiyeh on head, holding Palestinian flag. 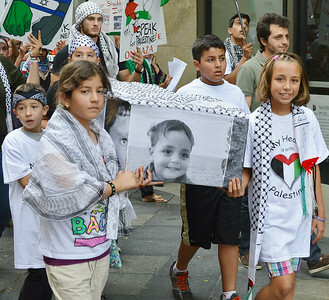 Three young women holding Palestinian flag with picture of Al Aqsa mosque on it, next to them young girl holding "free Palestine" sign. 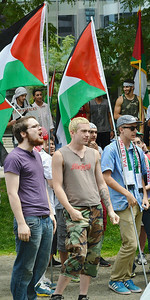 Young man shouts at rally, Palestinian flags in background, two other young men next to him. 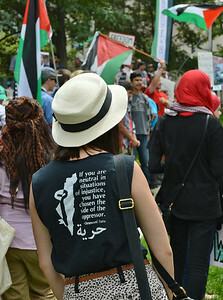 Woman wearing straw hat and t-shirt with Desmond Tutu quote about injustice and oppression on it, protesters with Palestinian flags in background. 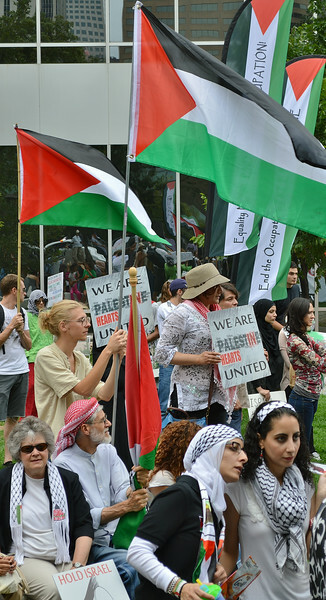 Man wearing keffiyeh, standing on wall, gestures while speaking into micophone to large crowd with signs and Palestinian flags, man to his right smiling. 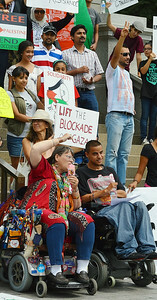 Two people in wheelchairs speak to each other, protesters with signs about Palestine standing on steps behind them. 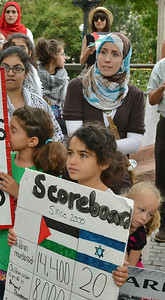 Young girl holding sign with picture of man on it, at palestinian protest.